As students and families all across the nation scan vacation promotions for deals on spring break vacations, Friends of the Earth (FOE) turns a scrutinizing eye to the popular cruise ship option. Dr. Ross A Klein, PhD released a 36 page report prepared for FOE on the topic, Getting a Grip on Cruise Ship Pollution, in early December, 2009. 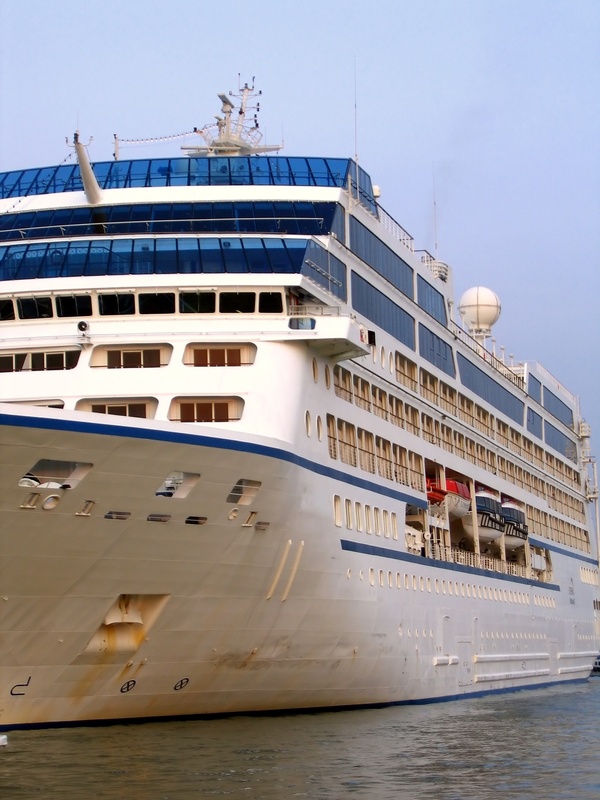 According to Klein’s report, pollution from cruise ships surpasses even airfare by threefold. Cruise-liner waste is discharged into the environment in two streams; water pollution and air pollution. Wastewater produced on these ships comes in the forms of blackwater, sewer sludge, gray water, solid waste, hazardous waste, oily bilge water and ballast water. In addition to the obvious environmental problems derived from the release of waste and waste water into the oceans, ballast waters can also have devastating effects on local ecosystems. Ballast water is ocean water that is stored on-board a ship within reservoir tanks in order to control buoyancy. Water is taken on to offset the passengers and cargo at one port and discharged at another as passengers disembark. Ballasts can hold upwards of 50 million gallons of water and can carry millions of hitchhikers to foreign ports. Organisms from fish and seastars to crabs and sea jellies can be displaced thousands of miles away. Josephine Hearn’s Stowaway Species Interactive tells the tale of the mitten crab, native to China’ Yellow Sea finding its way to the Thames, San Francisco Bay and Baltimore Harbor. The Round Goby fish of the Black and Caspian Seas settled in the American Great Lakes. Japan’s yellow and purple seastar managed to colonize Tasmania Port Hobart in densities up to 1100 individuals per cubic meter. These invading species can be devastating to an ecosystem. Each ecosystem depends on a predator prey balance. Non-native species have no native predators and can therefor multiply in numbers that their native counterparts cannot match. Very quickly, these non-native species can out compete other native species for space and resources. Removing these species is a costly and often futile endeavor. Hearn reports that while divers were able to remove 21,000 seastars from Port Hobart, the remaining population quickly recouped their previous densities. It is from its air pollution that the cruise ship wins the award of largest polluting mode of transport. Klein points out the majority of cruise ships run on bunker fuel. Bunker fuel is composed of residual components of refined crude oil. It is diluted but its sulfur content is 2,000 times that of diesel fuel. Some ships converted to gas engines before gas prices sky rocketed. With the price of gas so high, there is little incentive for this to become a larger trend throughout the industry without international regulations. Beyond the sulfurous engine emissions, cruise ships incinerate massive volumes of waste, from trash, to oil sludge every day. Klein explains the contents of these incinerator emissions. “The emissions from onboard incineration and its ash can include furans and dioxins, both found to be carcinogenic, as well as nitrogen oxide, sulfur oxide, carbon monoxide, carbon dioxide, particulate matter, hydrogen chloride, toxic and heavy metals such as lead, cadmium and mercury, and hydrocarbons” (p 9). California attempted to implement a ban on incineration within 27 miles of the shore, they eventually settled for three. Alaska has had some success with wastewater and air emissions standard enforcement through regulation and the use of on-board observers, this is hardly the fun and sun spring breakers seek. Other coastal US destinations certainly could follow California and Alaska’s lead and implement similar standards. Some of the most popular cruise destinations lie outside the jurisdiction and wealth of the US. Jamaica, Antigua the other islands of the Caribbean, depend on tourist dollars. Even if they were willing to take the risk of pushing cruise business away by implementing emissions standards, they would be unable to fund any regulation of such standards. Further allegations have been slung across the blogiverse against the cruise industry citing poor working conditions for crew members and lax security. If you were thinking of cruising down to the islands this spring, you just might want to reconsider. Note: Future posts will include articles on vacation options and their environmental impacts. Drop a comment if you have any suggestions for vacation ideas you would like to see explored. Hearn, Josephine. “Stowaway Species.” On Earth: Environmental Politics People. Winter2010, Vol. 31 Issue 4, p42-43. http://www.onearth.org/article/stowaway-species. Accessed on January 3, 2009. Klien, Ross. “Getting a Grip on Cruse Ship Pollution.” Friends of the Earth. Decemer 1, 2009. http://www.foe.org/getting-grip-cruise-ship-pollution. Accessed on December 30, 2009. “Bunker Fuels.” Liquid Minerals Inc. http://www.liquidminerals.com/fuels.htm Accessed on January 3, 2010.